Money may not grow on trees, but it does still grow, completely passively. It's the nature of compound interest that your money is always making you more money, and that new money in turn is making its own money, and so on. You may not notice it on small scales, but it is always there, working in the background. Suppose you had one million dollars to invest in a low-cost index fund earning an average annual return of 7%. If you let it grow, you’ll have 2 million dollars in ten years. That’s right- a brand new one million dollars was created, completely passively. You didn’t do anything- you just left the money alone for 10 years! But it gets better: while it took ten years for your money to grow the first million dollars, it only takes five more years to grow the next million. And three years to grow the million after that. That’s the exponential nature of compound interest, as we first explored in our post on the early retirement equation. Another example: A single dollar is worth more than you think. Almost everyone in first world countries can scrounge up a single dollar per day. My wife’s grandmother is 96 years young. If she started a dollar a day habit at age 16 and invested in low-cost index funds, she’d have $3 million dollars right now, and could use it to leave quite a legacy. Or, she could have started drawing on and enjoying her first million over thirteen years ago. It’s never too early to start investing. Yesterday is best, today is a close second. This is the power of compound interest. I like to think of this compounding as a force that pushes money away from zero. The more money you have, the more interest it earns, which in turn grows additional interest. 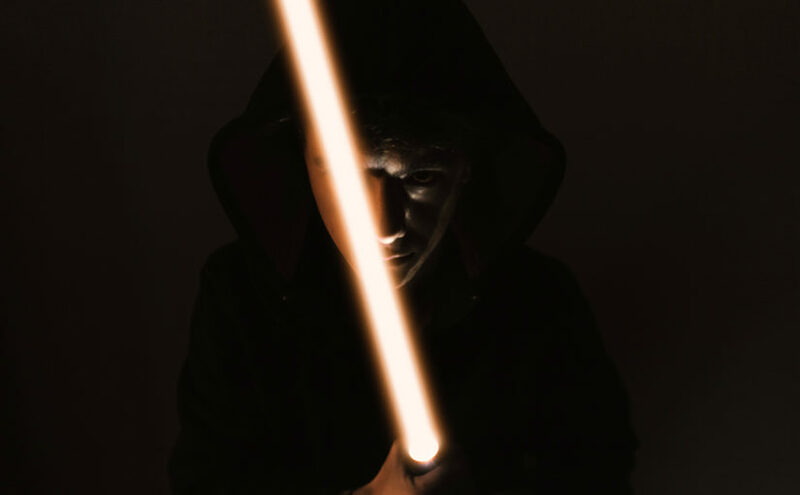 Over time, the force becomes so strong that even large unexpected expenses and market downturns aren’t enough to bring your balance to zero. This is great if you’re an investor, but it's a nightmare if you're in debt. Remember that interest is a two-way street: while investors earn interest, debtors pay interest. That same force that keeps the investor afloat is accelerating debt holders in the opposite direction. Instead of your dollars working FOR you and earning you more money, each dollar paid towards interest is working AGAINST you. This makes less money available for saving and increases the likelihood you’ll take on more debt, pushing you exponentially further in the negative direction! Here, I’ve taken the annuity equation, assuming a 7% annual market return, and plotted it in blue, to show an investor's gains over time. 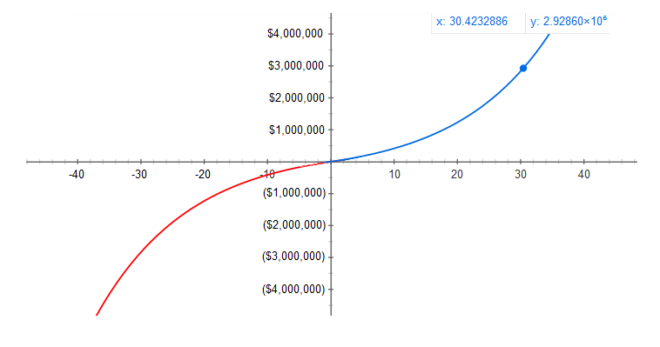 I took the same equation and flipped it over the X/Y axis and plotted it in red, to show a debtor’s losses over time. The X axis shows time in years, the Y axis shows dollars. Compound debt is no joke: It’s the entire business model behind credit cards! As you can see, when you're on the debt side, everything is backwards. Every rule of thumb we know about FI runs in reverse. When you hold debt, not only are you literally making someone else rich, but it’s as if time is moving BACKWARDS for your money! That’s why I plotted the years as negative on the red side. This is a visualization of the opportunity cost of your money: the time you are losing by not investing, or equivalently, the time you’d need to invest to get out of the debt hole. Suppose I have $30k of credit card debt, at 20% interest, compounded daily. 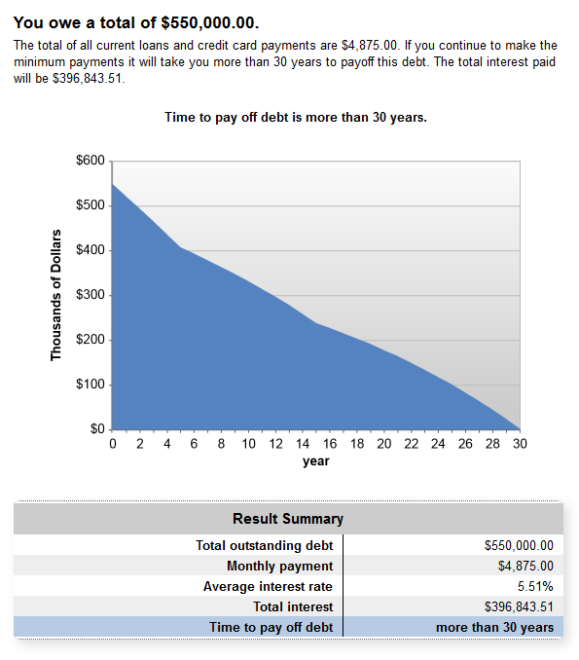 If I only make the minimum payments required, it will take 18 years and over $50k to pay off this $30k debt. And this makes the huge assumption that we aren’t adding any more debt on for those 18 years. But that’s a horrible assumption, as all credit card companies know: the more you pay in interest, the less cash flow you have available, and the more likely you’ll need to take on new debt to fund future purchases! It’s quite a vicious cycle, which is why many of us stay on the red side of the curve our entire lives. According to statistics from the federal reserve, the average American household has over $16k of credit card debt! How did this become the norm?! How did we all, collectively, move to the dark side? If you take a look at what percentage of the average American budget goes toward interest, you might be shocked. Let’s do an example following two fictional young couples and see how their debt choices influence their wealth over time. Jill & Ben are in their early twenties and recently graduated from college. Jill worked hard in high school and received good grades, earning a partial college scholarship. She took on part-time work to help fund the remainder of her expenses. Jill shared an apartment with three other roommates to keep her expenses low. She was able to graduate school without any student loan debt. Her partner Ben also avoided student loan debt, in his case by filling out the FAFSA and qualifying for the need based Pell grant. Jill always avoided credit card debt. She pays her bills off at the end of each month, and avoids buying anything she can’t immediately afford. Ben had a few hundred dollars of revolving credit card debt, which Jill encouraged him pay off before they built an emergency fund together. Jill didn’t need a car on campus, saving her extra cash during her part-time employment. She purchased a used Honda Fit for $3800 cash following graduation. Ben lives close enough to bicycle to work, so they are a one car household. Jill and Ben both work and play in the city, so they decided to rent a cozy two bedroom apartment together downtown. The rent is a bit high, so they decide to find roommates to keep costs reasonable. Because they have no monthly debt, they have plenty of free cash flow to save each month. They want to save for a few years and buy a small home with a 50% down payment. In the year following graduation, Jill and Ben pay $0 per month towards interest, and after finding roommates, $700 per month towards rent. They have enough slack in their budget to save almost 50% of their income for the future, setting them up for a working career of about a decade. Jack & Kim are also in their early twenties and recently graduated from college. Jack didn’t apply for any scholarships in high school. He tried filling out the FAFSA, but got frustrated and gave up after a few hours of paperwork. He didn’t want to work: he was convinced that even a part-time job would affect his grades. Jack rented a luxurious studio apartment with no roommates, because he hated the thought of sharing a bathroom. Jack relied on student loans to fund his college years, and graduated college with $45k of debt. He jokes that at least he did better than Kim, who graduated with $65k in student loans. Together the couple owes a $110k in student debt at 5% interest, which they'll repay over 15 years. Jack and Kim also accumulated $20k in credit card debt over the years. It started in college, and crept up gradually. Cash flow always seemed tight, particularly with their large student loan payments, so they needed to put large purchases on credit more often than not. Their credit card interest rate is 18.9%, compounding daily, which is relatively average in the industry. Paying the minimum, it will take over 16 years to pay this debt off, assuming they don’t charge any new expenses to credit, of course. After graduation, Jack and Kim bought a new house in the suburbs, about 25 miles away from the downtown area where they work. With almost no money down, they took out a $350k home loan at 5% interest, fixed for 30 years. The couple believes strongly that “renting is throwing away your money”. They pat themselves on the back for only borrowing $350k, even though the bank approved them for a loan as high as $500k. As seen above, in their first year following graduation, Jack and Kim start off with over $2,500 per month in total interest payments, exceeding the principal on their debt. While they both enjoy good salaries, they have no slack to save any money. Jack even stops the 2% 401(k) contribution his company signed him up for by default. He needs every dime he earns. Times are tough, and life is expensive. Jack and Kim end up needing to put more and more of their purchases on revolving credit. If they stay on their current path, they will still be in debt 30 years down the road. OK, I know, my example couples are a bit contrived. I intentionally paired together two spenders and put them head to head against two savers to show the stark contrast between the two. And the debt carried by Jack and Kim is above the national average. But I know there are plenty of people in these shoes, who may not understand the long-term consequences of the decisions they make when they're young. At their worst, Jack & Kim were spending almost $2500 per month on interest. That's more than my entire FI budget, just on interest! And interest is intangible… it's money you spend to stall paying more money. It's robbing Peter to pay Paul. You can see how this use of debt can quickly trap you in the red for life. Add in the principal, and the couple is paying almost $5k per month towards loan payments. Somewhat surprisingly, I found that only about a third of this debt is mortgage related. Though he may not know it, Jack is spending 40% of his budget on interest. I’d wager most folks with credit card debt, auto loans, mortgages, and student loans are in a similar boat, with a very large portion of their take home pay going towards interest every month. If this is the norm, it suddenly makes sense when people say they can’t save any money. How can you save when all your extra money goes to interest? I understand why so many people think I'm eating dog food when I tell them I live comfortably on less than $30k a year! What’s the opportunity cost here? If Jack and Kim were investing their $2500 per month in low-cost index funds, they'd have $3 Million in 30 years. Or, they could reach FI long before that: with a 40% savings rate they'd be free after a working career of only two decades. Instead, in 30 years, Jack and Kim will still be in the rat race, wondering why they can’t seem to get ahead. They'll still have their overpriced pre-assembled collection of construction materials. They'll still have auto loans, using up numerous new cars over the years with their long daily commutes. If their attitude towards money doesn't change, they'll still have as much debt as they did 30 years prior, if not more. Contrast this with Jill and Ben, who will be financially independent by the time they reach their 40s. This story is all about the cost of impatience. Unlike Jill and Ben, Jack & Kim purchased a house before they saved any money. They purchased shiny new cars they couldn’t afford. They used credit cards to buy things they didn’t have the cash for. I’m not trying to pick on Jack. Ten years ago, before my financial 180, I was pretty much him! Jack had more options than he realized, though. He could have waited and saved up. He could have lived with parents or roommates for a few years. Kim could have driven a used car. It only takes a few years to get onto the blue side of the curve and get your snowball moving in the right direction. But we live in America, where you can have almost anything you want, as soon as you want it, whether you can afford it or not! Jack & Kim's decisions weren’t necessarily bad, it’s just that they had huge associated costs they may not have understood when they made them. Instead of financial warnings, it’s like we’re still living in the old days where marketing departments advertised cigarettes to children on the Flintstones. Debt is cool! All your friends are doing it and living large! Convenient payday loan offices are popping up at every corner across the nation! At least interest rates are relatively low right now, historically speaking. The examples I give in this article will only get worse in the future as interest rates rise. Debt can still be a powerful tool for businesses to purchase assets with a reasonable payback period, like factory tools and other infrastructure. Know what isn’t an asset? Luxury cars, exotic vacations, and weddings. Televisions and fancy over-priced houses. When you use debt to buy things you can't really afford, you have a full-blown debt emergency! Hey Jack & Kim- it’s not too late! If you want out of the rat race and in on the good life, put your expensive house on the market ASAP. Downsize to something small close to work. Sell the cars and share a used Honda. Start paying your loans down like crazy- throw all your newly liberated dollars at them. Learn to cook. Take control of your monthly bills and shopping expenses. Then, when the debt fire is out, come on over to the blue side of the graph. Figure out how many years you want to work, set up an automatic savings plan and relax. Congratulations are in order- you just cut your working career in half. I do understand that some of you really are just scraping by. You're down on your luck, have family issues, and might be earning close to minimum wage. But remember a key point here: if you don’t have enough money for savings in your budget, you don’t have enough money for interest, either! Get rid of the stigma of living below your means, driving older used cars, or living with parents or roommates for a few years. Be patient and save for purchases that actually make you happy. These are not the traits of the poor. These are the habits of future millionaires. Try it out for yourself: plug in all of your debt into this calculator. 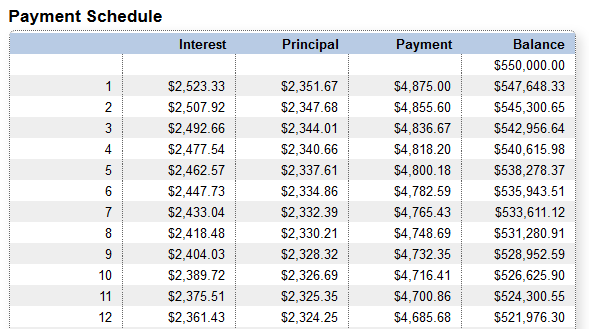 Include your mortgages, cars, loans, credit cards, etc., and calculate what your total monthly interest payment is. Then divide this by your total monthly expenses and multiply by 100 to see it as a percentage of your budget. Does the percentage surprise you? Let me know in the comments! Interested in starting your own Financial 180? You've come to the right place. The math is easy: create a gap between what you earn, and what you spend. If you can save half your income, your working career will only be around a decade long! Want to shorten it even more? Read on to see exactly what expenses the wife and I cut from month to month. Track your progress against the milestones of FI, and gradually build up your own savings snowball. Check out the books and links in our resources section and jump-start your journey to FI. The you ten years from now will be glad you did! Are you tracking your net worth yet? Sign up for Personal Capital today! Excellent points. Interest can either work for you or against you–but it’s always your choice, whether you realize it or not. Exactly! For some reason, it’s completely ‘normal’ to have 30+% of your income go towards debt, but having a 30+% savings rate is considered “extreme.” Go figure. I like the idea of interest being a force both positive and negative accelerating away from zero, good way to visualize this concept! Glad I found your blog Joel! An Australian FB page for Mustachians listed it as an interesting read. Liked this concept of interest due to debt being reverse FI – with the banks winning out. A few years ago, the bank I’m with started printing on their credit card statements – if you pay minimum payment, this is how long it will take you to pay it off. And if you paid a much higher monthly payment, it will only take you a few years to pay off. Interesting for a bank to be giving you a heads up, I thought. This article was a nice visual reminder. I’m looking forward to more compounding interest on the blue, not the red side! Pingback: #14 | Joel from Financial 180: Are you on FIRE? 180 Publishing © 2017-2019. All Rights Reserved.